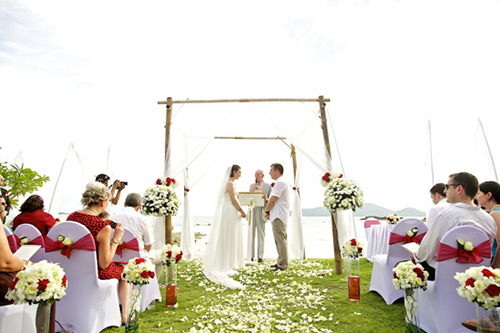 Thanks to its relatively modest size and wide selection of beaches, getting married on the Koh Samui sand is not only possible but preferable for many couples to be, especially in the dry season months from January to April. Most of Koh Samui’s more popular resorts are beachfront properties, which means beach wedding ceremonies are a common sight in places like Chaweng and Lamai Beach. In fact, the island is so easy to travel around that you can choose virtually any of the bays to tie the knot by the lapping waves. Beachside villas are also in abundance, which offers the possibility of a more private experience for those that prefer and exclusive celebration. Couples that choose a private villa wedding are able to personalise most aspects of their wedding ceremony to ensure a magical, bespoke ceremony. The following elements can all be customised to suit a couples preferences and personalties. Larger, established villa rental agencies like Luxury Villas and Homes often construct a special shrine or wedding alter from bamboo and flowers, which can be placed right on the beach. This makes for some supremely romantic photographs and allows guests to gather round on the sand and share the moment. Some couples even have floating platforms build out in the water, with a walkway for the couple to reach the alter, while others add various decorations such as petals on the sand to add to the idyllic scene. A number of small bays and islands pepper the Koh Samui coast. This means it is possible to create a real desert island atmosphere for your beachside wedding. But for couples that choose a Koh Samui beach wedding in a private villa as their venue the feeling of exclusivity is guaranteed, no matter how close the villa is to the main tourist action. Hiring boats and getting the guests to a remote venue can be a little complicated, so most couples simply opt to marry on the beach in front of the villa they are staying in or in the grounds of the property itself. This means they can head back to the convenience and comfort of the villa when it’s time for the dinner and party to start.